When I first arrived in Durham over 20 years ago, it was pretty sleepy. Downtown, beautiful old buildings were boarded up, and after the offices closed each day, the place was a ghost town. There was some good food to be found, but craft beer was almost unknown in North Carolina: I could count our interesting breweries on one hand. But sometime in the ’90s, the collective frustration of a lot a creative people seemed to give the town the momentum it needed to break out. Building by building, Durham found exciting new uses for the old structures, ways to preserve our traditions in distinctive new ways. Similar things have happened to craft beer in our city, and the growing beer culture seems to parallel the efforts that have breathed life into the old tobacco warehouses and textile mills. Once we embraced craft beer, we did so in a manner that grafted new approaches onto old traditions that feel true to Durham. The World Beer Festival-Durham, first staged in 1996, has both led and reflected the growing love for great beer. To enjoy the festival weekend to its fullest, take time to visit some of the many locations where great beer is playing a part in Durham’s resurgence. Come Saturday, the festival will draw you to our downtown and its many beer-friendly destinations, so start your visit instead in the neighborhood of Duke University, about a mile west of the town center. Ninth Street has until recently been home exclusively to locally owned businesses, the source of much of its relaxed charm. Gradually, a few national chains have crept in, and ambitious hotel and apartment projects may further erode the local character. All the more reason to seek out three Durham gems that no franchise operation will ever be able to replicate. Dain’s Place (754 Ninth St.) promises “Pub & Grub” on its sign. Inside is the perfect college bar, which means juicy, customizable burgers and tater tots, but also an extensive craft beer list and bar staff that know what they’re pouring. The place is dark and cozy—bordering on cramped when crowds gather for a Duke game or trivia night. Fans of Dain’s rave about the burger selection, which includes the masterpiece that put this small bar on the TV show “Man v. Food”: a half-pound patty with bacon, sweet chili, cheddar, coleslaw. Oh, and a hot dog. It’s called “The Defibrillator,” a name that an enterprising brewery should someday borrow for a doppelbock brewed in Dain’s honor. Where Ninth Street crosses Main, it becomes Erwin Road. Just past the overhead railway bridge is my favorite place to take out-of-town beer geeks, who have no idea that the combination gas station, car wash and convenience store happens to house one of the best beer selections in the South. Sam’s Quik Shop (1605 Erwin Road) has served the needs of Duke students since the days when it was a restaurant called the Blue Light, a name that can still be seen on the front wall. Under the direction of John Boy, the third-generation owner, the predictable assortment of Moon Pies, newspapers and soft drinks has gradually been displaced by aisle after aisle of extraordinary beer—a staggering 1,700 brands and counting. I think of Sam’s as my beer reference library and the tattoo-decorated staff as skilled librarians. Which seasonal beers have arrived? How many examples of sour brews can you give me? If you have a question about a beer, there’s a good chance they have tasted it and can help you. And, with a dozen taps behind the counter, why not linger over a pint and select some rare bottles—from North Carolina or elsewhere—to load in the car for enjoyment later. Or visit Sam’s new bottle shop in south Durham (see below). As the evening wears on, head back under the railway trestle and up Broad Street, parallel to Ninth, to The Green Room (1108 Broad St.), an old-fashioned gaming hall where good beer has always been part of the deal, the kind of neighborhood bar that closed for one night recently when Iron Maiden was performing because it didn’t seem fair for one of the members of the staff to have to work when they all wanted to see the show. This Durham landmark offers a cooler packed with over 100 brands of American micros, domestics and imported beers in bottles. There also are pool tables, shuffleboard and darts. On any given night, you might find bikers alongside the crew from the American Dance Festival, while a well-stocked jukebox provides background. The Green Room manages to be a dive bar without the sleaze, just a warm welcome for its patrons. Plan A. If you have tickets to the evening session of the World Beer Festival (6 p.m.-10 p.m.), you can take advantage of a Saturday afternoon-only brewery tour. But start with a full stomach. You’ll find Dos Perros, a Mexican-inspired restaurant, in a lemon-yellow brick building at 200 N. Mangum St. Chef Charlie Deal is a great friend to beer, with a thoughtful selection always on hand to accompany creative lunch dishes like spicy mushroom empanadas with rustic tomato salsa. Deal is rightly known for beer dinners he hosts at Dos Perros. On one memorable afternoon, he asked me to join him as he planned an event. Sitting at a back table, we tasted every beer in the featured brewery’s portfolio and discussed beer flavors; then I listened as he turned those impressions into recipes for the dinner. In an hour, the menu was written. Next, you’ll need a car for an excursion to Triangle Brewing Co. (918 Pearl St.), Durham’s production-only brewery, located about a mile to the east, in time for a 1 p.m. brewery tour. If a well-known West Coast brewery hadn’t already brewed a beer called Dead Guy, Triangle would have been the natural home for the name: This brewery had an actual dead guy. During renovations, the remains of an unfortunate gentleman were found in the basement, sealed in a plastic bag. Owner Rick Tufts notes dryly that the man probably didn’t tie the bag himself, and his identity and demise are still a mystery. With a mixture of reverence and gallows humor, Triangle tries to honor and appease the spirit of the man they’ve dubbed Rufus, their patron saint. The name Rufus, as well as being appropriately Southern, means “red,” so the first in the Rufus Reserve Series of Triangle specialty brews was an imperial red ale. The series augments a year-round lineup of Belgian-style and American ales. Triangle is open for tours only on Saturday (adults only, with ID; $3 per person). With craft breweries increasingly embracing cans, this is a great opportunity to see a small-scale canning line in situ. You can also try their beers at the new Triangle tap room, Pints & Plates (see below). While you’re in the neighborhood, give your palate a change of beverage. Sociable, affordable and low in alcohol, cider has more in common with beer than with wine, and its promoters have hoped for years that it might emulate craft beer’s success. Large commercial brands are pleasant enough, but ciders in the more rustic vein are more likely to catch the imagination of the craft beer crowd. This must be the hope of Bull City Ciderworks (113 S. Elizabeth St.), Durham’s own cidery, which relies on North Carolina apple varieties to make three fresh hard ciders of varying sweetness, all with a traditional feel. Bull City ciders are available on tap at a number of local restaurants and bars, but the treat is a visit to the cidery, where you can drink a pint at the reclaimed wood bar, sit at one of the the outdoor picnic tables and buy your favorite variety in a growler to take away. In distinct contrast to cider’s bucolic image, Bull City Ciderworks is sited next to an old auto business in a former industrial area of central Durham, close to successful developments like the Golden Belt complex. Now, retrace your drive back to the downtown in time to visit Bull City Burger and Brewery, Durham’s only brewpub (107 E. Parrish St., around the corner from Dos Perros), before the evening session. Until Seth Gross opened BCBB in 2011, Durhamites knew him as a wine guy. Little did they know that his first loves were beer and food: As a newly minted chef in Chicago in the ’90s, he persuaded Goose Island Brewing Co. to take him on as a brewing assistant. Gross was in on some landmark beers created at Goose Island, including Hex Nut Brown Ale and the original Bourbon County Stout, called the first beer aged in a bourbon barrel. His Durham brewery continues a tradition of well-balanced, food-friendly beers—only available here. BCBB strikes a casual tone, with the seven-barrel brewery located behind glass directly beside the entrance. Patrons line up to place food orders for burgers and hot dogs made from grass-fed North Carolina beef, order pints of beer from a selection of eight taps at the bar, then sit at long communal tables or in the tiny beer garden out back. Should your pre-fest hunger call for pizza rather than burgers, Gross has recently opened Pompieri Pizza in an old firehouse around the corner, where you can enjoy Bull City’s beers along with your pie. Plan B. 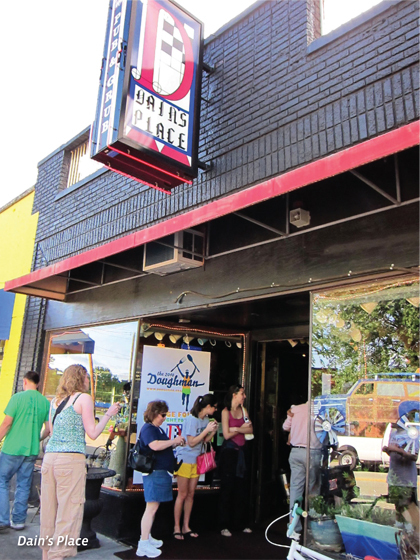 If you have tickets to the afternoon session of the World Beer Festival (noon-4 p.m.), afterward you can explore the most vibrant, fastest-developing area of Durham, the Central Park District. Stroll north on Rigsbee and look for the large reverse white “F” on a red background at the entrance to Fullsteam Brewery (726 Rigsbee Ave.). In four short years, the brewery taproom has become a Durham institution. Fullsteam founder Sean Lilly Wilson and I were among the organizers of Pop the Cap, the grassroots group that modernized North Carolina beer laws in 2005. After nearly three years of politicking and brainstorming together, I knew his next career step would have to give him room for his restless imagination: He’s found it at Fullsteam, where everything from the beer to the company’s steam­punk graphics, to the funky reclaimed objects that decorate the taproom carries his imprint. Fullsteam’s plow-to-pint philosophy links agriculture and beer, a connection that is surprisingly novel in brewing. The approach infuses the brewery’s creations with local flavor, literally, incorporating summer basil, sweet potatoes or native papaw—as well as more conventional ingredients. Patrons can gather at the small bar or find seats at common tables in the spacious adjoining room or at a few tables outside. There are 22 taps, about half of which offer Fullsteam beers, with the rest devoted to North Carolina guest beers and specialty nonalcoholic drinks. One or more of Durham’s fleet of food trucks are generally parked outside for hungry guests. Not in the mood for food-truck fare? You can sit down for a meal and a beer at a former gas station that is now Geer Street Garden (644 Foster St.). Inside and out, the white-painted red brick is worn with time. There are a few tables in the tiny interior, where the bar is located, and long picnic tables out back in the trellis-shaded beer garden. The menu might be described as modern down-home Southern: Try the fried chicken and arugula salad, or grilled pimento cheese. The 12 taps tilt toward North Carolina beers, though not exclusively. Geer Street is one of the few spots in town where you will find beers from Ponysaurus Brewing, a nanobrewery that is Durham’s newest. In case you missed their collaboration beer at the festival, brewed with festival host All About Beer, this is your chance to try one of their eight ales. Or look for the elegant paper-wrapped 22-ounce bottles, with the unmistakable half-pony half-dinosaur logo, at local specialty retailers. If your evening is winding down, allow time before 8 p.m. to stop at the new Beer Durham Craft Beer Store (404 Hunt St.) and grab a growler of beer to go. In 2013, a change in state law allowed retailers to fill and sell these large glass jugs, expanding the number of places where consumers can purchase fresh beer for consumption off site, including many beers that are otherwise only available on draft. Beer Durham embraced the new option, and offers a choice of 20 taps. Try a pint, then fill a 32- or 64-ounce growler with beer from an unusual or sought-after brewery. If you’re up for music, retrace your steps in time for the 9 p.m. show at Motorco Music Hall (723 Rigsbee Ave.), a converted garage turned concert space. Full bar and 18 taps—all interesting except for the obligatory PBR. Check their website for performances and times. The full name—The Kotuku Surf Club—is a nod to owner Rhys Botica’s New Zealand origins and the Kotuku Life Saving Club, where he hung out with his rugby team. The Surf Club, however, does not evoke sports, or surfing, or even the kotuku (Maori for the white heron). Inside, it is spare and appealing: with white subway tiles on the walls, black wooden booths and a curved dark wooden bar and back bar Botica moved from a 1940s venue in Chicago. It’s a no-frills, no-kids, no pretensions neighborhood bar with a dose of cool. For a leisurely start to Sunday, join the brunch crowd at Tyler’s Restaurant & Taproom (324 Blackwell St.) in the renovated warehouses of the American Tobacco district. If it’s before noon, all you can do is admire the impressive tap array (blue laws still in force), but after noon, any of the 90-plus beers will be served in fine condition and in the appropriate glass. Founder Tyler Huntington wasn’t always in the beer world—he trained as a ballet dancer before injury halted that career—but a stint working at Redhook Brewery in Seattle gave him a taste for the kind of beer he wanted to see take hold in his home state. He opened his modest original taproom in Carrboro in 1998, now one of four such in the Triangle, and helped pave the way for the blossoming beer culture Durham enjoys today. With the afternoon stretching ahead of you, return downtown to Main Street for a convenient Durham pub crawl. Visit each bar for variety, or settle down at one of many with outdoor patios to while away the day. Start with The Federal (914 W. Main St.), named for the Federal Electric Co., which served this area decades ago. The deep red walls are hung with illuminated beer logos, trays and vintage ads for old American regional breweries, and framed Life magazine covers. The decor is retro-dive, but the beer selection is right up to date: all U.S. beers, mostly good craft. The surprise is the unusual and unusually good food from the Fed’s kitchen. Next door is the James Joyce Irish Pub and Restaurant (912 W. Main St.) an unpretentious Irish bar whose insta-pub furnishings—the Guinness signs, the signposts in Gaelic and English—have mellowed into something very like the real thing over the years. Long and narrow, with dark, paneled walls, the place inspires loyalty in its regulars. Satisfaction Restaurant and Bar (905 W. Main St.) has been serving town and gown alike from this location since its founding in 1993 by two Duke grad students. The bar, with its wood-clad walls and neon beer signs, still says “college,” although the LP covers on the wall—Springsteen’s “Darkness on the Edge of Town” and Jethro Tull—say “college, circa 1980.” A testament to the staying power of good beer and pizza. Alivia’s Durham Bistro (900 W. Main St.) is as bright and open as the bicycle shop the space once housed, now outfitted with a bar and mahogany benches recovered from older Durham buildings. Roll-up glass-paned garage doors connect the indoor space with an extensive patio that is shaded in the hot months and warmed by fire pits when it gets cooler—great people watching. Fun and stylish, strong beer list. Last year, Triangle Brewery opened their downtown taproom, Pint & Plate, at 802 W. Main St., pouring 10 of the brewery’s beers plus one cask ale served via English-style beer engine. The kitchen opened this summer, serving a simple menu of burgers and apps. It operates as a private membership club, with a one-time fee of one dollar for your lifetime membership. What else can you get for dollar that will last the rest of your life? The final stop is a four-block walk to Bull McCabes Irish Pub (427 W. Main St.), a dimly lit Irish bar where books line wooden shelves and photographs of the three Kennedy brothers stare down from the wall. Guinness is actually the only Irish beer on a menu dominated by U.S. craft brew, but it’s the Fuller’s London Porter on draft that makes the whole walk worthwhile. That, and the new patio bar, which is one of the most pleasant venues downtown. If you are leaving town by way of Interstate 40 on your way to the airport or points farther east, pick a route that takes you first down leafy Hope Valley Road (NC 751), where beer culture is blooming in South Durham. In a cluster of stores that cater to the new housing developments nearby, you’ll find City Beverage (4810 Hope Valley Road) where the décor is a kitsch tribute to the ’50s and ’60s. In the Lava Lounge, there are deep-purple walls covered with red polka dots, and orange molded chairs around tables with old 33s and 45s embedded in the surface (probably the best comeback Mott the Hoople can hope for). Next door in the bar and restaurant, the walls are hung with innocently naughty movie posters and what looks like Don Draper’s bachelor pad record collection—if Don had more of a sense of humor. But the beer selection and food menu are no joke: There are over 30 taps and an extensive selection of bottled beers, and one of the more creative menus among local beer establishments. A couple of streets away is Sam’s Bottle Shop (1112 W Hwy 54), the brand new sibling to landmark Sam’s Quik Shop in the Ninth Street neighborhood. Here at the new location, owner John Boy finally has room to showcase (and even grow!) the 1,700 beer inventory in a two-story building with retail space on the first floor and a tasting room and outdoor seating upstairs. Twenty-eight taps for a pint while shopping. Finally, you’ll have nearly left the city limits before you reach The Glass Jug (5410 Highway 55 in the Greenwood Commons Shopping Center), which opened only in September. Sensitive to brewers’ and customers’ concerns about maintaining freshness in growlers not filled by the original brewers, owners Katy and Chris Creech invested in pricey counter-pressure fillers, usually seen only in breweries. This technology promises to reduce oxidation and keep your growlers of beer in good condition for up to a few months. That should help tide you over until the next World Beer Festival—Raleigh in the spring! I see articles all the time about glass jug, Sams, growler grlz and other bottle shops. How do I get an article writen up about my All NC bottle shop inside a Char-Grill. It seems like a ton of people would be intrested in it.